Restaurants are indeed hopping on the gluten-free bandwagon at a rapid clip these days, launching (or expanding) gluten-free menus at a pace that makes people with Celiac Disease -- and others following gluten-free diets -- thrilled. 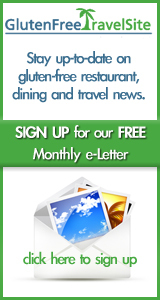 There are now more choices than ever before, and with increased awareness of Celiac Disease and gluten intolerance -- and the higher rate of proper diagnosis and demand for gluten-free foods that results -- the gluten-free community can continue to look forward to expanded options when it comes to dining out. Of course, the changing environment does come with its share of caveats...sometimes well-meaning restaurants may not fully understand all the intricacies of providing safe gluten-free meals, like all the steps that must be followed to avoid cross-contamination in the kitchen. So vigilance is always necessary. In contrast, there are some restaurants that are the "shining stars." I recently had the pleasure of speaking with Tony Cochones, Director of Food and Beverage at Glory Days Grill, who recently spearheaded the launch of their extensive gluten-free menu. This company is an example of setting the highest gluten-free (and general health) standards throughout their chain of casual dining restaurants, which are located in Maryland, Virginia, and West Virginia. Tony went on to explain that the founder of Glory Days, Jeff Newman, has a daughter who requires a gluten-free lifestyle. So he was very empathetic and supportive of Tony's efforts to make the dining experience for those following gluten-free diets as safe and enjoyable as possible. It is this supportive culture at Glory Days that empowers Tony and the Managing Partners at the chain and cements their own personal commitment to the company and its customers. The folks I've spoken with at Glory Days do indeed seem to be "raving fans" of the company and its culture of always "doing the right thing." Glory Days is also extremely supportive of the communities in which they serve, "giving back" to local organizations and encouraging a "family friendly" environment. But back to the food...The gluten-free menu took 6-12 months to put in place, from conception to sourcing of the ingredients to developing the recipes and launching the menu. Tony worked with a medical doctor expert to develop the menu and has personally worked to educate both the kitchen and wait staff at each Glory Days Grill location. When a gluten-free diner comes into the restaurant and asks for a gluten-free menu, a manager is alerted and personally visits the table to ensure the guest's questions or concerns are addressed. Glory Days and Tony share the belief that offering a gluten-free menu is all about hospitality and being able to "offer our gluten-free guests the exact same experience they'd have if they didn't have a gluten intolerance or allergy." The range of choices on Glory Days Grill's gluten-free menu is extensive, including burgers, steaks, chicken, seafood, ribs (my personal favorite...falling-off-the-bone tender), and other entrees and sides. And they even have a gluten-free KIDS menu! Best of all, dedicated fryers which are ONLY used for gluten-free foods even allow Glory Days to offer gluten-free french fries, sweet potato fries, and their famous chicken wings. Currently, burgers are served without buns, but Tony is very interested in making the burger experience "complete" once he is able to personally find a gluten-free bun that he believes is unsurpassed in both taste and texture. Glory Days is also absolutely fastidious about health and hygiene standards, voluntarily performing their own "health audit," using an outside service which visits each of their locations to perform "unannounced" inspections 3-4 times per year. After speaking with Tony, I've come to the conclusion that the gluten-free world would be safer and more enjoyable if all casual dining restaurants would adopt these high standards for both their food safety and their gluten-free offerings. If you have a Glory Days Grill location near you in Maryland, Virginia, or West Virginia -- or if your business or personal travels take you to one of those areas -- be sure to pop in and try out their gluten-free menu!